Interpretation / Preaching / What is Missional? The gospel lectionary text for the Sunday after Easter is John 20:19-31, which immediately follows John’s account of Easter morning. Not many preachers save their best material for the Sunday after Easter, and some churches don’t have a sermon at all on this day. After Holy Week and Easter, we’re just spent. But there is so much in this text for the preacher, and if you’re preaching on this Sunday — relish it! I dare say most preachers have and do focus on Jesus’ appearance to Thomas, Thomas’ doubt, and then confession of faith. Some have called this skeptic’s Sunday. But I want to focus on Jesus’ appearance in vss. 19-23. There is so, so much here that illuminates our understanding of the missional church, the church that God has sent into the world. Indeed, this is one of the touchstone passages that helps us to understand the church as fundamentally missionary in nature. First, let’s begin with the key phrase “as the Father has sent me, so send I you.” That line shapes the whole interpretation of the passage. 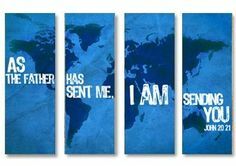 Jesus is sending his disciples into the world just as he has been sent into the world. They now become apostles. The first Greek word for “sent” in the passage is the Greek word “appostolein,” which means “to send.” When Jesus first arrives, they are locked in a room in fear; now they are receiving a commission, they are being sent, just as Jesus has been sent. The analogy between Jesus’ sending and the disciples’ sending is crucial, because it means that the pattern and shape of the apostles’ mission is none other than the pattern and shape of their Lord’s mission. From this hermeneutic lens, we approach the rest of the passage…back to the beginning of the text. Before saying anything else, Jesus enters the room with the greeting “Peace be with you,” saying it three times in this text. Though this was and is a standard greeting, in this passage it carries more meaning. The first word of the risen Christ to his gathered disciples is peace. We might also say it is wholeness and reconciliation, and it invokes the blessing and the presence of God. To people who are locked in fear, and about to receive a commission, peace is the first word and defines their mission. In his life and work, Jesus has brought peace and wholeness between God and humanity, and offers that peace and wholeness to those who follow him. Likewise, those who go in his name are sent rooted and centered in Jesus’ peace, to bring peace, make peace, and offer Christ’s peace. The church that goes into the world, into neighborhoods, businesses, legislatures, public forums, and faraway places, should have peace as their first word, and their repeated word. For a world that is locked in many rooms for fear of many things, the note which opens the symphony of gospel proclamation is peace!